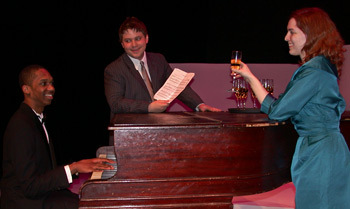 University of Lynchburg Theatre will present the musical, Merrily We Roll Along, by Stephen Sondheim and George Furth. The production is directed by Jeff Wittman, professor of theatre. Show times are 7:30 p.m. February 24 – 26, and 2 p.m. February 27 in the Dillard Fine Arts Theatre. On opening night of the performance and in honor of Stephen Sondheim’s 80th birthday, Dr. Richard Burke, LC professor of English, will present Happy Birthday Mr. Sondheim, a biographical and visual retrospective of the composer’s life and work. The program will begin at 6:30 p.m. in Daura Gallery, Dillard Fine Arts Center, and is free and open to the public. Based on the 1934 play of the same name by George S. Kaufman and Moss Hart, this production of Merrily We Roll Along retains the basic structure and overall theme of the original play but updates it to encompass the period from 1957 to 1976. Moving backwards in time, the story revolves around a Broadway composer turned Hollywood producer and traces the lives of three close friends through each milestone of their personal and professional lives as they reflect on years of aspiration and reality and dreams both fulfilled and lost. The musical won the Olivier Award for Best Musical in 2001, and Sondheim was nominated for the Tony Award for Best Original Score. The box office (434.544.8380) opens Monday, February 21, and will be open from 1 to 5 p.m. weekdays and a half hour before curtain time. Tickets are $10, adults; $8, senior citizens (60+); $5, students. All seats are reserved.